Christchurch's Hagley Oval, the venue for the opening game of the 2015 World Cup, has been passed fit by the ICC to host international cricket. 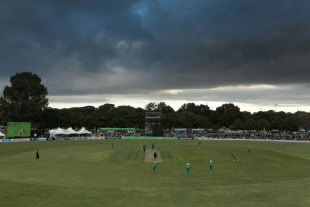 A New Zealand Cricket release stated that ICC officials had assessed the ground's on and off-field facilities and concluded they were of "good standard" to host international fixtures. The Hagley Oval was developed after Christchurch's earlier venue Lancaster Park was abandoned due to extensive damage caused by the 2011 earthquake. It has already been used for domestic games and World Cup qualifiers, and will debut as New Zealand's eighth Test venue with the Boxing Day match against Sri Lanka in December. "From the earliest days of tournament planning, knowing what sport means to Cantabrians and the challenges the city has faced, we had a vison of Hagley Oval playing a key role in the World Cup," said Therese Walsh, the World Cup head for New Zealand. "The oval and pavilion are truly world class, and it will be a very special occasion when Hagley Oval is beamed around the world for the opening match on 14 February." "The Hagley Oval offers rare flexibility," said David White, the NZC chief executive. "It can operate in boutique mode when smaller attendances are expected, or can expand to cater for a crowd of about 20,000 when required. We're delighted to have another quality international venue approved by the ICC." "We call it a ground for all generations," said Lee Germon, the Canterbury Cricket chief executive. "The Hagley Oval balances nicely the heritage of the precinct, and all the modern, high-tech innovation that is needed for an international cricket venue. Receiving the official stamp of approval is an important milestone for a ground designed to serve the region for the next hundred years."